One of the most difficult aspects of A good workout plan is finding a good cardio component when you first begin. For many people, it is very hard to think about running a few miles each day when they have been inactive for a long stretch of time. * Walking and fat loss are very compatible. It is a great way for a beginner to start. * Walking to lose weight requires very little equipment. It is more about dedication and consistency. * Walking is easy on your joints. You can progressively increase your strength and endurance with a regular routine. 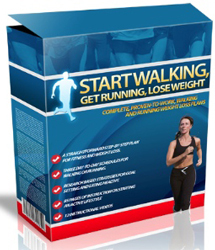 * Walking provides you fat loss results as you work to get strong enough to start running. * A weight loss workout plan will always include three elements: (1) Making good food choices in your diet, (2) Regular exercise to increase lean muscle tissue, and (3) cardio to keep your metabolism elevated. * Diet will always be the #1 key in ANY weight loss program. * Just because you adhere to a walking program for fat loss doesn't mean you can eat anything you want. That's not reality. Making good food choices needs to become a lifestyle habit, not just a strategy for episodes of weight loss. You can walk to lose weight, and keep fat off permanently, by following a progressive program that becomes a lifestyle. Thousands have done it. You can too.